The Spanish lynx and the Eurasian lynx are very similar in appearance except the Spanish lynx is about half the size. They have a body length of between 85 and 110 cm (34 - 43 inches), a tail length of approximately 13 cm (5 inches) and they weigh between 10 and 13 kg (22 - 29 lbs). Their coat is a grey/ brown colour with distinctive black markings and a light coloured underside. They have tufted ears, long whiskers and wide feet. 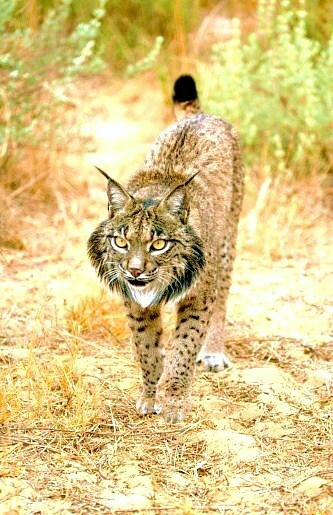 The Spanish lynx is mainly nocturnal but during the winter months it is active during the day.